• For quantitative determination of acetylcholine and evaluation of drug effects on acetylcholine metabolism. • Use 20 μL samples. Linear detection range: colorimetric assay 10 to 200 μM, fluorimetric assay 0.4 to 10 μM acetylcholine. 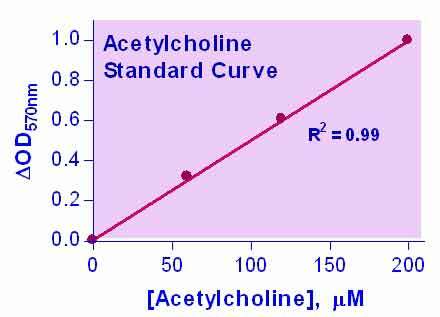 • ACETYLCHOLINE is a neurotransmitter produced in acetylcholinergic neurons. It plays important roles in skeletal muscle movement, regulation of smooth and cardiac muscles, as well as in learning, memory and mood. BioAssay Systems method provides a simple, direct and high-throughput assay for measuring acetylcholine in biological samples. In this assay, acetylcholine is hydrolyzed by acetylcholinesterase to choline which is oxidized by choline oxidase to betaine and H2O2. The resulting H2O2 reacts with a specific dye to form a pink colored product. The color intensity at 570nm or fluorescence intensity (530/585 nm) is directly proportional to the acetylcholine concentration in the sample. 1. Can the acetylcholine level in human serum be measured with this kit? Plasma levels in young women: 456.1 ? 53.1 (SEM) pg/mL which equals 3.1 nM. (Kawashima et al. Neuroscience Letters 80:(3), 339-342; 1987.) If this is indeed a representative study, it would mean that our assay is not sensitive enough to detect acetylcholine in plasma or serum samples. Furthermore, plasma levels of choline are much higher (~10 ?M) and will thus have to be removed before assaying. 2. What is the principle of this assay? The assay is based on the enzymatic degradation of acetylcholine to choline and acetate and the subsequent detection of choline. 3. Can this assay measure acetylcholine in brain tissue? We have not tested acetylcholine assay specifically with brain tissue samples, but believe it should work. Typical concentrations of choline and acetylcholine in brain tissue are 10-70 nmoles/g. So if the tissue sample is suspended in ice-cold PBS at 500 mg/mL, we should expect 5-35 ?M choline or acetylcholine in the supernatant. Suggested protocol: weigh brain tissue (approx. 50 mg) and add 100 ?L ice-cold PBS, lyze tissue by homogenization or sonication. Centrifuge at 14,000 rpm for 10 min at 4?C. Carefully transfer the supernatant to a clean tube and perform the assays for choline and acetylcholine. Due to the low concentration range, the fluorescence assay procedure is recommended. 1. He C, et al (2012). Embryonic exposure to benzo(a)pyrene influences neural development and function in rockfish (Sebastiscus marmoratus). Neurotoxicology 33(4):758-62. Assay: Acetylcholine in Fish tissue (Pubmed). 2. Mani V, et al (2012). Effects of the Total Alkaloidal Extract of Murraya koenigii Leaf on Oxidative Stress and Cholinergic Transmission in Aged Mice. Phytother Res. Assay: Acetylcholine in Mouse brain (Pubmed). 3. He C, et al (2012). Exposure of Sebastiscus marmoratus embryos to pyrene results in neurodevelopmental defects and disturbs related mechanisms. Aquat Toxicol 15(116-117):109-15. Assay: Acetylcholine in Fish tissue (Pubmed). 4. Chen L et al (2012). Acute exposure to DE-71: Effects on locomotor behavior and developmental neurotoxicity in zebrafish larvae. Environ Toxicol Chem. 31(10):2338-44. Assay: Acetylcholine in Fish tissue (Pubmed).